Learning scales on the guitar is important for a few different reasons. They build strength and independence in your fingers in a way that is not possible just playing songs. Playing guitar scales also helps to train your ears to recognize common note combinations. They can also be used as note choices in your guitar solos and for melodies in songwriting. Learn 5 basic open position major scales. Specifically the “guitar” keys of C, G, D, A and E. Great for bass runs and fills. 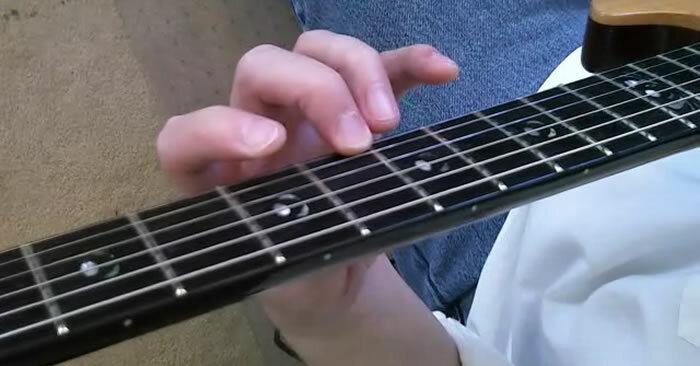 Playing chromatic scales on the guitar not only helps build technique but also helps your understanding of the guitar fretboard. What are guitar scales and why are they important to learn? Decode guitar scale charts and play them on the guitar. 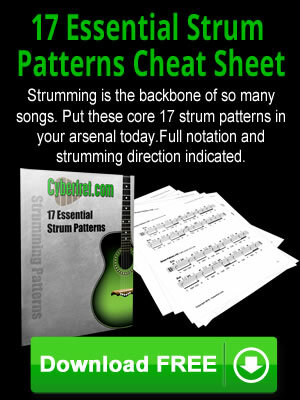 Learn 7 major scale patterns mapped out on the neck of the guitar in the key of C.
All guitar lessons on Cyberfret.com are in the process of being updated. Below are some scale guitar lessons from the old website that have not made it to the new one yet. Basic Guitar Scales - In this lesson you will learn 5 basic guitar scale shapes that every guitar player should know. Open position major scales for guitar - These are the 5 most common keys for guitar C, G, D, A, E.
Minor Pentatonic Scales for Guitar - It's the king daddy of all guitar scales used for improvisation. The Minor Pentatonic Extended Guitar Scale - In this guitar lessons Chris Weyers shows your a very common guitar scale and how to incorporate it into your lead guitar solos. Blues scale forms - Learn all 5 positions of the blues scale for guitar, and the common extended forms. The basic theory behind a blues scale is also explained in this guitar lesson. Major Scale Shapes - This is a study of the CAGED guitar scale system. This system is one of the foundations to understanding the neck of the guitar. Chromatic Scales for Guitar - A chromatic scale contains all 12 possible pitches before arriving back at the starting note name an octave higher. 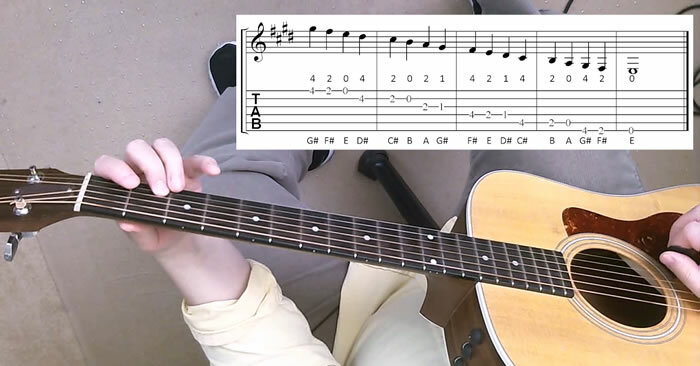 This lesson covers the basic ways to play chromatic scales on the guitar. Guitar Scale Reference - Here is a listing of some basic fingerings for many common guitar scales. Scale Practice Exercises 1 & 2 - Video Guitar Lesson - Guitarist Adam St. James from Logical Lead Guitar shows a couple of essential guitar scale practice exercises. Pentamodal Method - Pentatonic Scales & Modes - Paul Tauterouff shows you a simple method to begin using modes in your guitar solos. 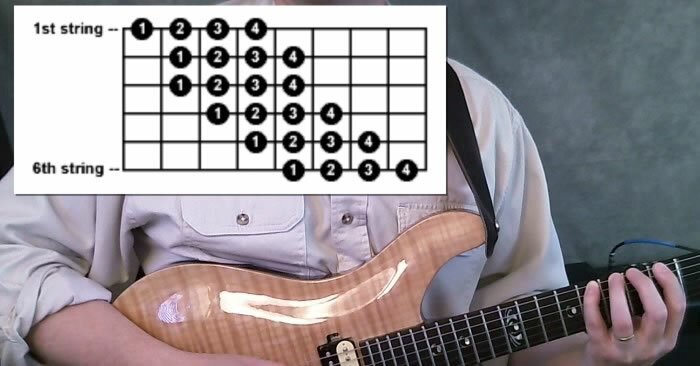 Diagonal Pentatonic Scale Patterns - Guitarist Paul Tauterouff shows you how to break out of the box when playing pentatonic scales on the neck of the guitar. Guitar Scale Numbering System - Guitarist Adam St. James helps you decode the numbers used for guitar scales in music theory. Reinventing Scales - Mixotonic - Guitarist Brian Huether teaches you how to create a very useful "Frankinscale". Open Position A Major Pentatonic Scale - Guitarist Dario Patrono from "Guitar Tips For Kids" shows how to play an A major pentatonic scale in the open position.